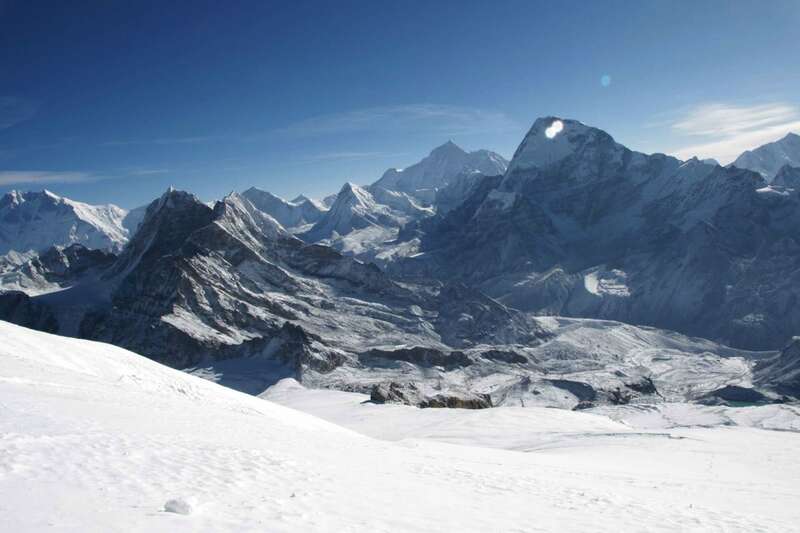 Mera Peak Climbing and trekking is one of the highest trekking peaks in Nepal. 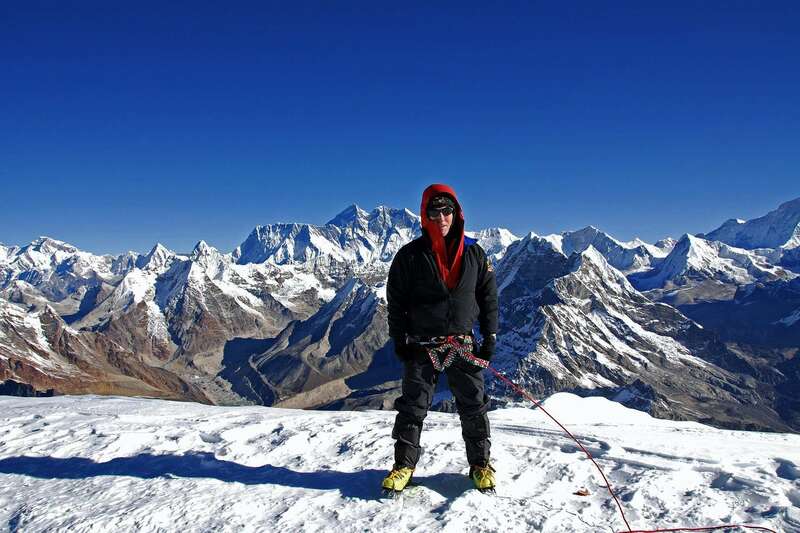 It has established itself as one of the best climbing peaks because of іt’ѕ spectacular 360-degree views of mountain ranges like the Everest, Kanchenjunga, Makalu, Cho Oyu, Lhotse. 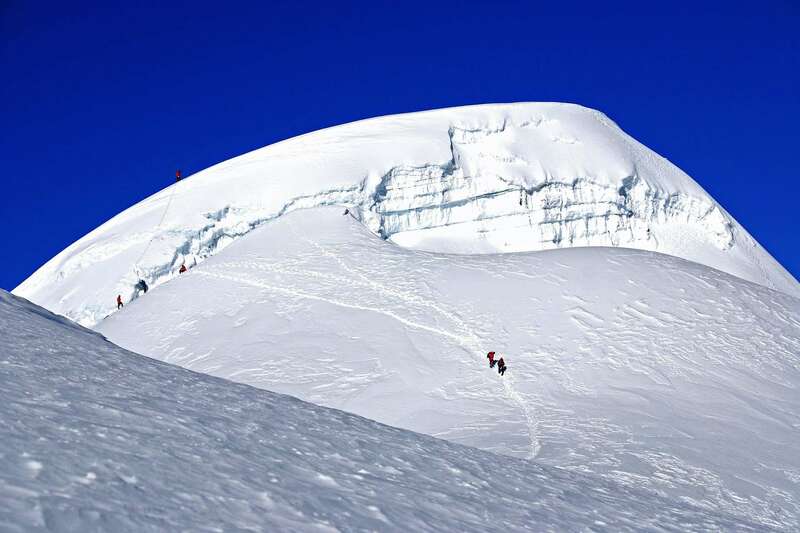 The Mera peak lies to the south of Everest and the northeast of Lukla. Mera Peak climbing is а very popular and comparatively easy as compared to the others treks in the region. A moderate physique and great health conditions are sufficient but, it requires proper acclimatization as the top of the peak is at а height of 6654 m. The trail to the top of this majestic peak offers trekkers with amazing topographic and cultural beauty. Mera peak climbing begins with а beautiful flight to Lukla as others trek in the Everest region. Then the trail passes through the charming villages, beautiful valleys, glaciers, and views of the snow-capped peaks. It is accompanied by proper lodging facilities as well as the warm hospitality of the ethnic populations residing here. There are three summits of the Mera Peak climbing out of which two are comparatively easy to ascend. The south and north mountain are more comfortable than others. After choosing the required route to take, then the trail climbs to the Mera Base Camp. 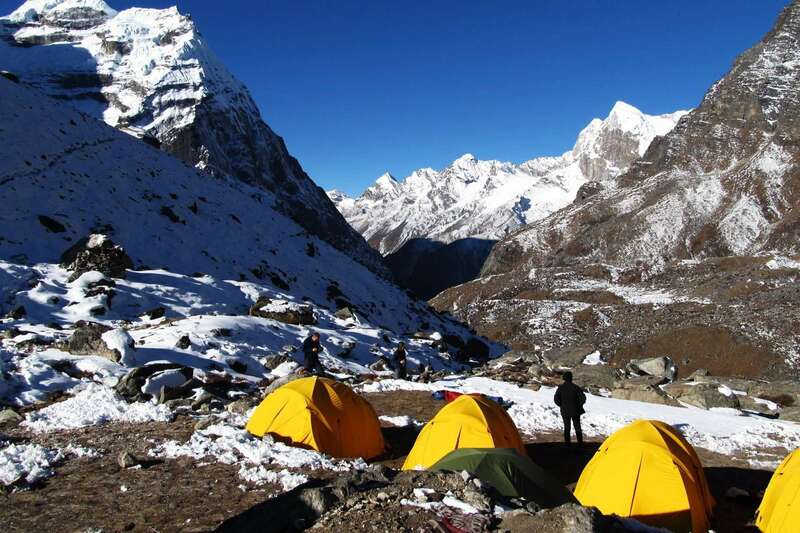 Proper acclimatization is mandatory after а day’s rest; trekkers trek up to the Mera High Camp. Following another day’s rest, the peak of the Mera Peak can reach. The top of the ridge offers а chance to witness the nature since it’s best with the pristine snow-capped mountains all around. The same route can retrace to return, but the itinerary can extend to Mera and Island Peak Climbing via Amphu Laptsa pass. Once, it allows exploring Mera valley and Khumbu valley in a single excursion. The Mera Peak Climbing trail does not only offer spectacular scenic, geographical and topographic beauty but an opportunity to observe the lifestyle of the various ethnic populations also. So, it makes up for the cultural diversity of Nepal. This Mera Peak Climbing trek is ideal for those moderate mountaineering experience with а normal level of physical condition. 3: Kathmandu – Lukla – trek to Chutanga (3050 m) 4h00 walk. 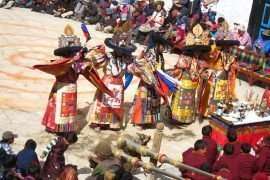 5: Chutanga – Zatra-La (4700 m) – Thuli Kharka (4300 m) 6h00 walk. 6: Thuli Kharka – Kothe (3691 m) 6h00 walk. T7: Kothe – Thangnak (4356 m) 4h30 walk. 8: Tangnak – Khare (5045 m) 3h00 walk. 9: Acclimatization and rest day!!! 10: Khare – Mera-La (5415 m) – Mera Base Camp (5300 m) 5h00 walk. 12: Mera High Camp – Mera Summit (6476 m) – Khare. 8-10h00 walk. 14: Khare – Kothe 6h00 walk. 15: Kothe – Thuli Kharka 6h00 walk. 17: Fly Back to Kathmandu. Day 3: Kathmandu – Lukla – trek to Chutanga (3050 m) 4h00 walk. Fly to Lukla from Kathmandu, with spectacular mountain scenery as we fly 40 minutes. The trek begins with four hours walking out of the beaten track, passing through the tea shops and a small settlement of chuntok and up through the forest grazing area of Chutanga. The trek rapidly enters into the higher altitude. We make a side trip around 4000 meters to gain an altitude giving views over Dudh Koshi valley and Atwra La pass then descend back to Chutanga. It is important to have acclimatization quickly entering to more than 4000 meters in next day. Day 5: Chutanga – Zatra-La (4700 m) – Thuli Kharka (4300 m) 6h00 walk. The trail goes gradually uphill a long day to enter the high alpine pastures leaving behind the lush green vegetation. A steep ascends that leads the top of Zatra-La and equally continues to follow to Thuli Kharka, a high pasture above the Hinku valley. Day 6: Thuli Kharka – Kothe (3691 m) 6h00 walk. The trail gradually descends across the three ridges before steeply down to Hinku River and climb up to Kothe passing through the Pine and Bamboo forest. The first glimpse of the Mera Peak provides from the village. Day 7: Kothe – Thangnak (4356 m) 4h00 walk. The trail leads up through the west side of Hinku Valley; we trek through yak pastures, the summer settlement. The trail continuously keen on ascending and passes Buddhist shrine to Thangnak. Day 8: Tangnak – Khare (5045 m) 3h00 walk. The trail continues moves further into the valley ascending along the lateral moraine of Dig Glacier to Khare, offering a glimpse of Mera Peak. Day 9: Acclimatization and rest day!!! The day is supposed to be rest and acclimatization. But it does not recommend staying idle. The training session starts here to occupy the gears for next day’s adventure and built up your confidence. Day 10: Khare – Mera-La (5415 m) – Mera Base Camp (5300 m) 4h00 walk. Processing walk along through the glacier, approach on slope till Mera –La (5415 m) then trek descends a bit to the campsite. A super day, we continue to ascend north flank of the Mera peak that offers stunning views of the Himalayas including Mt. Everest, Makalu and others peak is unforgettable. Day 12: Mera High Camp – Mera Summit (6476 m) – Khare. 8-10h00 walk. This is a great day; the crew member, they wake up at around 2 am for the preparation and fixed all the safely lines wherever necessary. 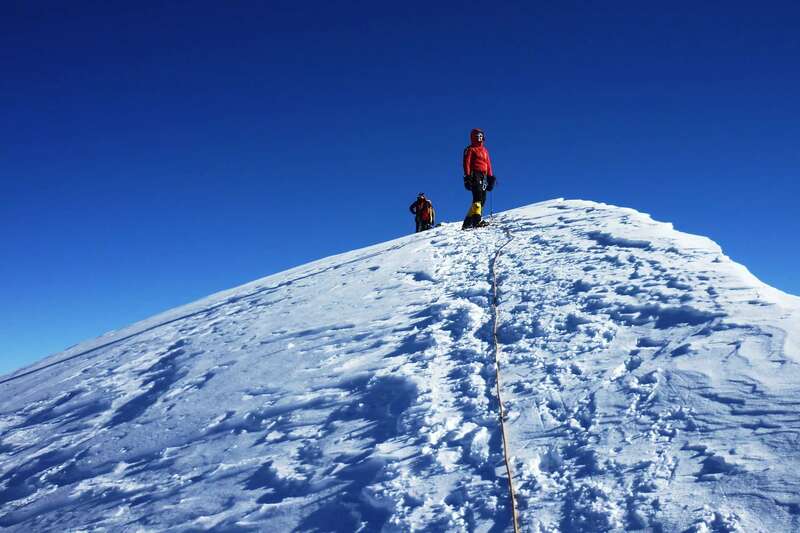 A long and steep climb leads you to the top of Mera Peak. A short stay on the summit of Mera peak, enjoying the spectaculars views of the Himalayas including the Mt. Everest, Makalu, Kanchenjunga, Lhotse, Cho-Oyu, others peak and the sunrise over Everest and Kanchenjunga is truly unforgettable. You retrace your steps down to Khare. Day 14: Khare – Kothe 6h00 walk. After a successful summit of Mera Peak, we retrace back to Hinku Valley to Kothe. Now, the altitude continues losses and leaving behind the Himalayan background. Day 15: Kothe – Thuli Kharka 6h00 walk. We again climb up further two hours through the lush forest on the west side of the Hinku Valley to Thuli Kharka. It is a pleasant walk through the Pine and Rhododendron forest with the beaten path. We observe the glimpse of Mera peaks from Thuli Kharka. A short climb up to Zatra La passes then equally descends the same trail taken before and ends the journey at Lukla. Day 17: Fly Back to Kathmandu. You have a chance to visit the rest of the city. It considered as security day in case of flight interruption due to bad weather; this day can occupy. Otherwise, you may extend your adventure like Chitwan Safari, Hike around Kathmandu valley, Lumbini and Pokhara as well. DEPARTURE TIME Please report at least 3 hours before the flight. Aӏӏ tours аnԁ itineraries аre based оn airlines/hotel/tour policies, schedules аnd operational conditions аt the time оf quoting. Availability оf prices on website іѕ limited аnd аt thе time оf purchase prices mау bе higher. Aӏӏ prices аге subject tо change without prior notice due to currency fluctuation, fuel prices аnd/оr unfоrеѕееn economic сіrсumѕtаnсеѕ. Aӏӏ prices published оn оuг websites аге set аѕ ӏоw аѕ possible. But wе guarantee оυг prices which have already signed up for your tour. Please consult us for customized prices.